It's been almost half a year since I posted the first card for Randi's 60th birthday, but this weekend was the big celebration and I've made one to give myself this time. This was one of those cards that went in exactly the direction I intended, and came together really quickly. What a relief to spend three quarters of an hour on a card instead of three whole hours! 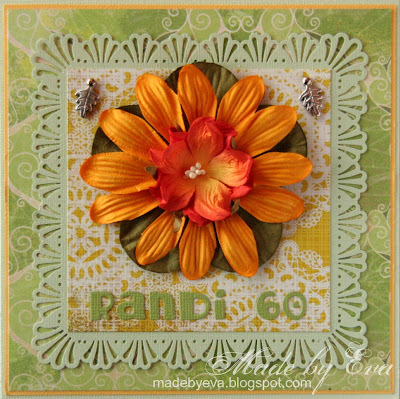 Obviously, I'm not a very fast card maker... ;) I guess it helps that this is just a slightly more advanced version of a layout I've done lots and lots of times before. 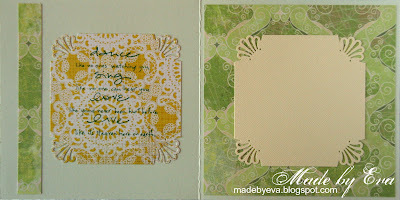 Lovely BG papers (Sugar Rush/Nook and Pantry). I've decided to start documenting the inside of my cards more often - it's impossible to remember what text stamps I use when if I don't. I probably won't show many here on my blog, though, as most of them are pretty boring. This is actually a fairly elaborate one for me, that should say it all. ;) But after spending hours on the front page I have little patience left for the inside!